If you’re looking for information on sproutarianism, you’ve come to the right place! This article answers the question: what is sproutarianism? This article also talks about what the advantages and disadvantages of the sproutarian diet are. When I first saw this mentioned on Wikipedia, in the same sentence as “juicearianism” and with no linking page, I thought it was going to be an even stupider fad diet. Not so. So it turns out that where juicers are fashionistas looking to get pretty, sprouters are looking to share the fundamental interconnectedness of the universal life force, man. The claims are ludicrous, but the diet actually has more nutritional value than either juicing or fruitarianism, if it’s done right. The diet started with Hippocrates Institute founder Ann Wigmore, who apparently passed the Sproutarian diet down to Viktoras Kulvinskas, whose book Survival in the 21st Century: Planetary Healers Manual (which I discussed in the introduction to this series, see vegan diets part 1) seems to be the only book that actually talks about Sproutarianism in any great depth, although he does advocate a combined fruit and sprout diet. The Rules: You can only eat sprouted vegetable seeds. 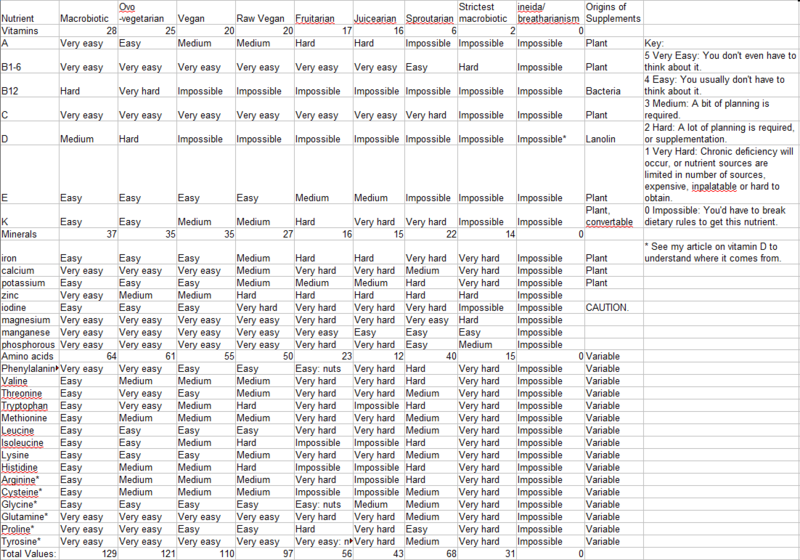 There may be other rules, but since all findable information is incoherent (the first 5 pages of the google search for “sproutarianism” and a few related terms), this is all I can glean. Good points: Potent veg! Aris LaTham, a food scientist and fruitarian, believes the original intent for Sproutarianism was for it to be used to heal sick people, and that it is too potent to be eaten all the time. Potency certainly seems to be both a positive and an issue, if the author of the Sproutarian is anything to go by. I would place this diet as verging on the psychonautical. I have heard from Steve Pavlina that Raw Veganism causes you to feel emotions more strongly, if that’s the case then it would follow that eating sprouted seeds could feasibly increase perception in a different way. I’d also like a better list of which sprouts are edible/inedible, including conditions under which they can be eaten, for example in The Sproutarian, he claims he eats fermented sprouted quinoa and sunflower seeds, with some very unappetizing photos, but it’s all rather confusing as to what actual processes are taking place, how he’s eating them, what he’s fermenting them in etc, for example the nutrition/toxin levels would differ depending on whether you drank the water (is it tap water or something more sinister?) they were fermented in or whether they were washed thoroughly (does this wash away the nutrients? ), and whether the sprouts are stood or fresh. I tried sprouting sunflower seeds and quinoa but neither of them did anything in water, despite what the internet said, so I think you need “special seeds” to sprout, not just supermarket ones, but I have no idea where to get them or what they are called or how much they would cost. The rest of the references are people criticizing the diet based on those 2 lines. I haven’t included such sources because they didn’t impart any additional information to me that I could use in this article. Conclusion: I’d really like to see a more reliable or academically written source stating what foods are eaten, describing how they are eaten, explaining where all the nutrients can be obtained from and evaluating how effective this diet is, using references (not just ones with further information on low-level nutritional concepts, but ones fully showing the jumps of logic necessary to arrive at a Sproutarian diet) and referring to case studies of sproutarians. Perhaps I will have to convert for a few weeks just to write a view from the inside. Do you have any more info on sproutarianism? Please contact me using the comments if you have any references about sproutarianism as I would really love to write a longer, better researched, authoritative article than this one. Update: I did my own experiment into sproutarianism which you can read about, but it was only over three days so I’d still like to hear any more information about sproutarianism and sprouting.